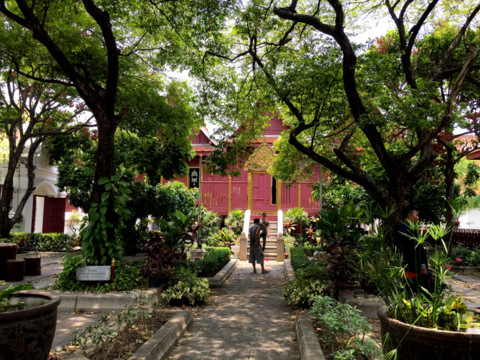 Wat Rakhang, an old Bangkok temple from the Ayutthaya era, is one of the favorite temples for merit making and one that you should include in your Bangkok temple tour. 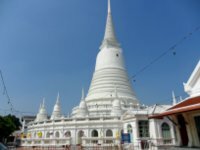 The temple was originally called Wat Bang Wa Yai and in the reign of King Taksin (1767 – 1782), he constructed his palace¹ nearby, the temple was renovated and elevated to a royal temple. 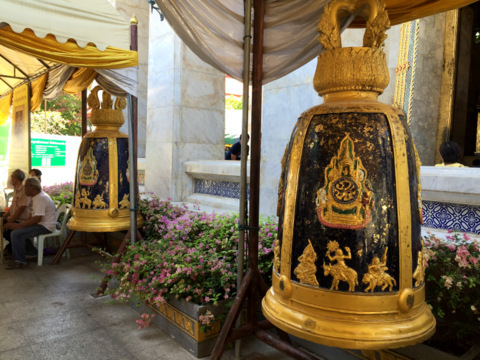 In the reign of King Rama I (1782 – 1809), a huge bell was discovered in the temple grounds. 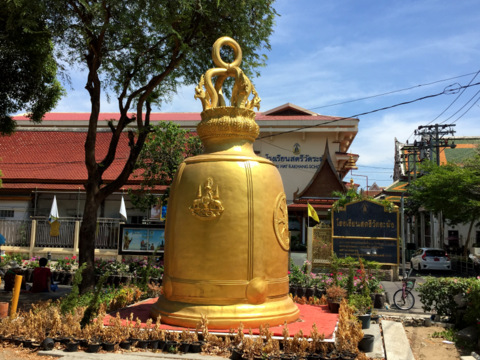 The bell was removed to Wat Phra Kaeo, the Temple of the Emerald Buddha and five new bells were presented by King Rama I as replacements. These five bells are still hanging in the belfry (ho rakhang) today. This golden bell by the river looks like a replica of that bell that was found in the temple more than 200 years ago. That’s how the temple got its present name, rakhang or bells. Its name in full is Wat Rakhang Kositaram Woramahawiharn, the last word indicating a royal temple of the second grade². ¹Today King Taksin’s Palace, Wang Derm is a kilometre away within the headquarters of the Royal Thai Navy. 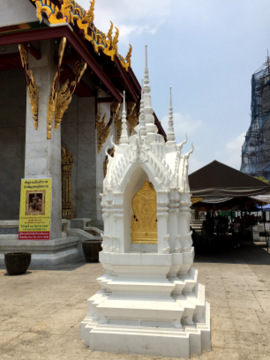 ²For the various classes of Thai Buddhist temples, please see Wat Mahapruettharam. It’s a local belief that the sounding of bells in a temple will bring a person fame and good reputation. For this reason many temples have bells for visitors to sound and make donations at the same time. 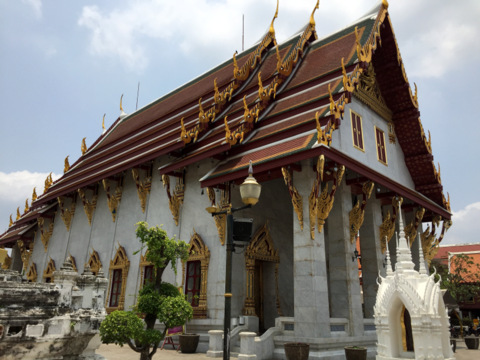 Wat Rakhang is popular with Bangkok residents because the first Supreme Patriarch, the spiritual leader of the Buddhist clergy in Thailand, once lived here. Somdet Phra Sangkharat was the first Supreme Patriarch in the Rattanakosin era. To get there, please see map to Wat Rakhang. 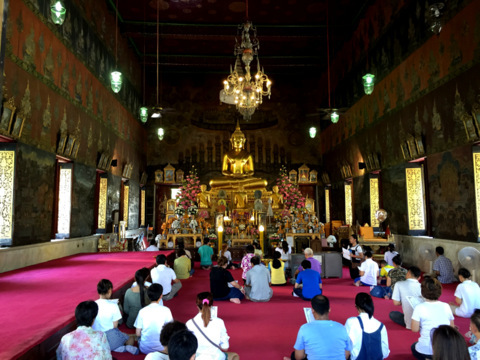 The visit to Wat Rakhang took place after a visit to the market at Wang Lang Pier near Siriraj Hospital. This turned out to be a blessing in disguise. The route took us through winding narrow alleys lined with shops before we got to the temple. 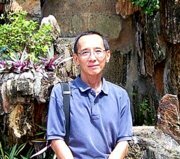 It was then that I noticed a wooden building (marker F on satellite map) on my right within a fenced enclosure separate from the main temple complex. Please refer to the satellite map of the temple showing the location of the various buildings mentioned. 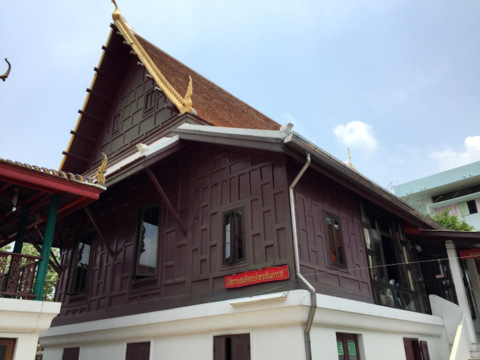 The wooden building is dedicated to King Taksin. 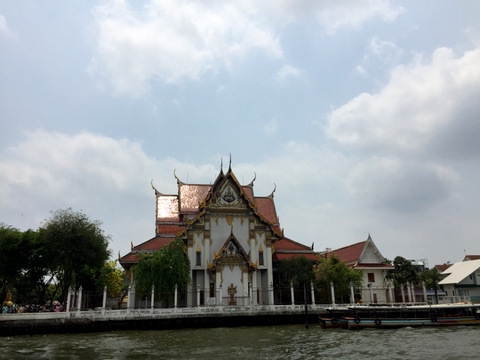 If we had taken the ferry that went directly to Wat Rakhang, we might have missed this building altogether. 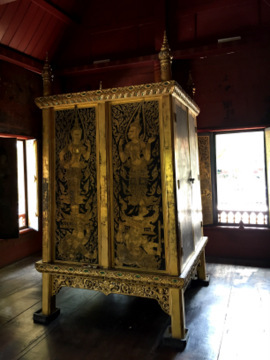 There’s an altar upstairs dedicated to King Taksin who reigned from his capital in Thonburi which is the area around the temple. There were a few visitors paying their respects at the shrine. 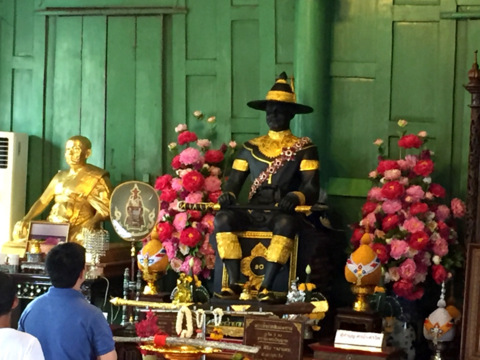 King Taksin is still revered by many places and there are shrines dedicated to him in Rayong and Chanthaburi. The main activities in the temple centre on the ubosot or ordination hall (marker C) that is within the main temple grounds. This place was far more crowded especially on a Sunday. 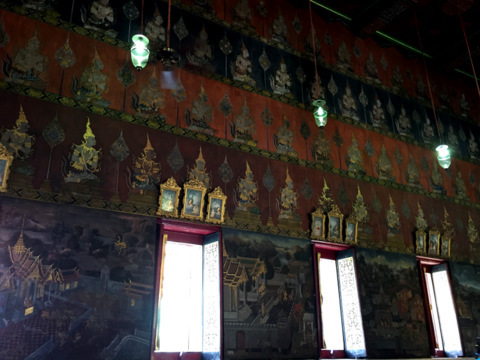 There was a service being conducted in the ubosot the walls of which had beautiful murals that are still in relatively good condition. 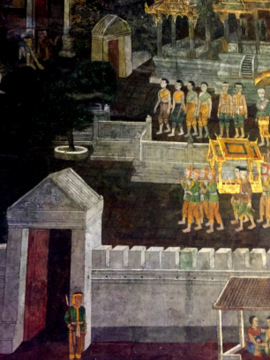 These murals were painted by a monk who was a famous artist in the reign of King Rama VI (1910 – 1925). 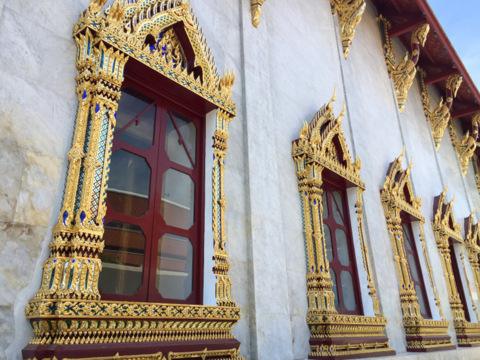 The windows of the ubosot are framed by ornate designs in gold with golden horn-like chofars protruding from the corners of the multi-tiered roof. Nine sema or boundary markers are placed around the ubosot. 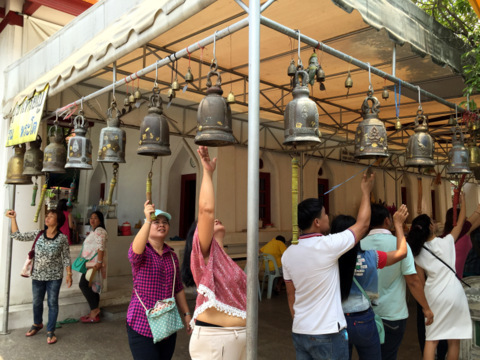 The bells outside the ubosot were pealing continuously as a queue of worshippers was knocking on them. 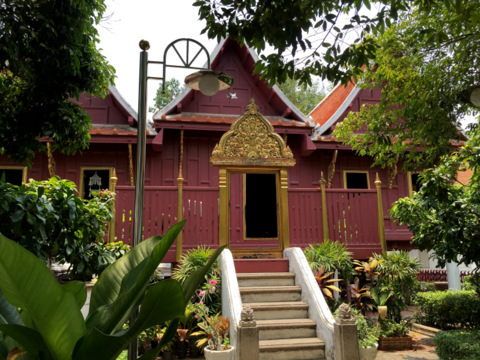 Just next to the ubosot is a red wooden building, the Ho Phra Tripitaka or monastic library (marker G) where Buddhist scriptures or Phra Tripitaka are kept. Tripitaka (tri-pi-dok) refers to the teachings of Buddha in three parts. 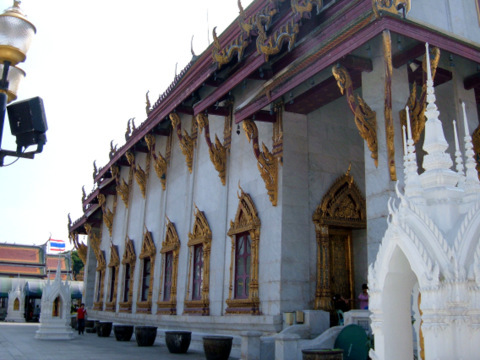 In the reign of King Taksin, these Buddhist scriptures were transferred from Nakhon Si Thammarat, revised and kept here. This building was also where King Rama I lived before he became king. 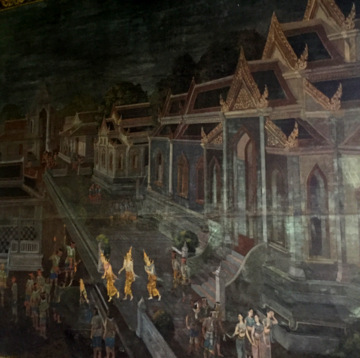 During his reign, King Rama I had the building restored and relocated to its present location in Wat Rakhang. The building consists of three parallel sections. 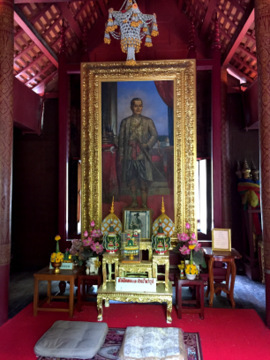 The central section has a portrait of King Rama I and an altar for worshippers to pay their respects. 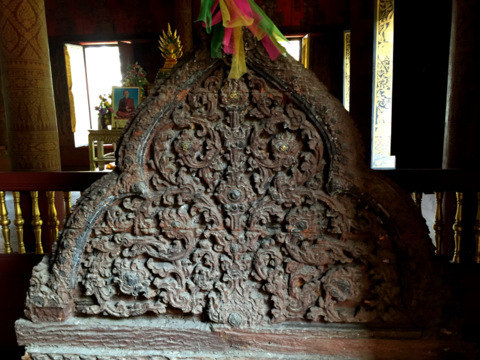 Two elaborately carved eave supports are on display within. Each section on the left and right contain a cabinet for the scriptures. The surfaces of these cabinets are beautifully etched with gold designs. 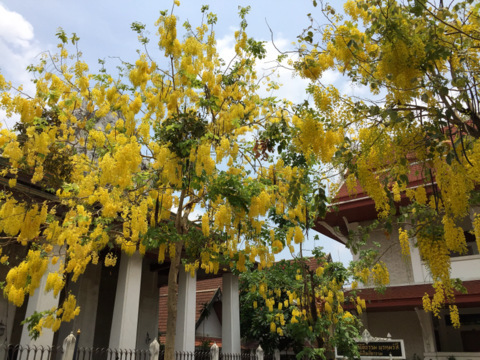 There’s a religious school in Wat Rakhang (marker H) and the bright yellow dork khun flowers on the trees outside the school were still in full bloom in May, well after Songkran. The other educational institution in the Wat Rakhang Girls’ School (marker I) which I thought was unusual. Most of the time, I’ve only encountered boys’ school within temples. 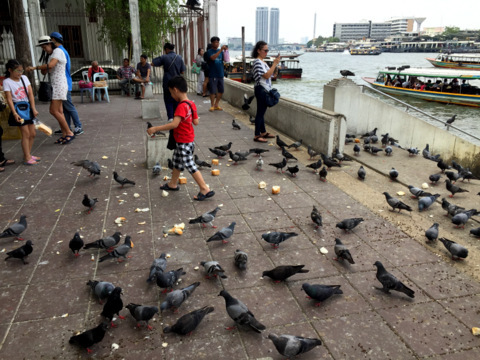 The open area between the temple and river provides for activities like feeding the pigeons, fish, releasing turtles, fish and eels as part of merit making with vendors selling the bread and live fish. The building right by the river is the monks’ quarters or kuti. This is the building that is the most prominent when the temple is viewed from the river. After touring the temple the most convenient way back is to take a ferry back to Chang Pier. As the ferry drew away from Wat Rakhang, I turned back to take a parting shot from the river. It turned out to be a rather gloomy shot. Or maybe I wasn’t able to catch the light at the right angle. It was a far brighter day on my first visit more than a decade ago. The map below shows the location of the temple and how to get there. A convenient way is to take a skytrain to the Taksin Bridge Station, go to the Sathorn Pier below the bridge and take a Chao Phraya River boat to Chang Pier near the Grand Palace. Or you can take the river boat from the Oriental Pier (Oriental Mandarin Hotel), Ratchawong Pier (Chinatown), Saphan Phut Pier (Memorial Bridge) whichever is convenient for you. 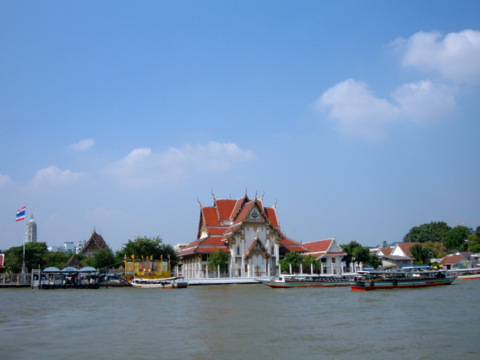 From Chang Pier take the ferry across to Wat Rakhang. Fare is 3 baht one way. 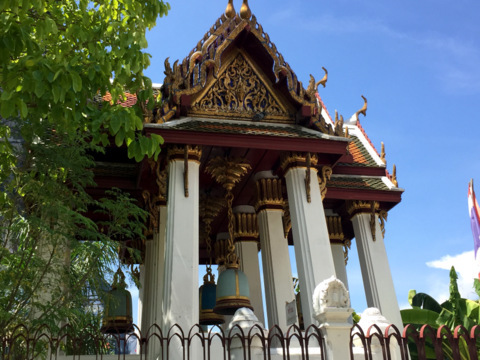 When you alight from the ferry at Wat Rakhang don’t go straight to the temple entrance if you wish to visit the building dedicated to King Taksin. This building is located to the right of the main entrance to the temple. Go along Arun Amarin Road till you see the arch to the temple. Turn into the road that leads to the temple. There’s a multi-story carpark and parking is free for the first hour. The temple is open every day from 8 am – 5 pm. Admission is free.